McKay Coppins writes the best piece in a burgeoning genre: The rise of Taggart Romney. 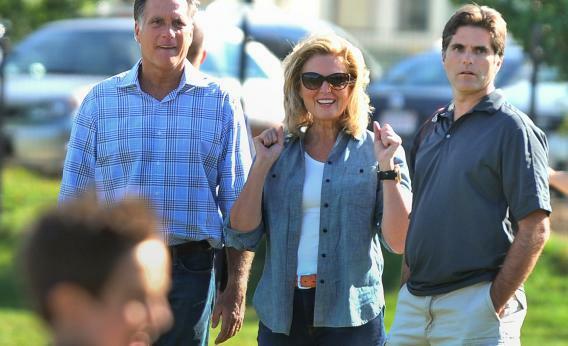 If Romney wins the presidency, his five successful, well-educated sons could provide the necessary building blocks for a political dynasty — and no one is more valuable to that future than Tagg, according to advisers, family friends, and campaign insiders. Already, his advice to his father is beginning to supersede what’s coming out of the Boston campaign headquarters — and many believe his influence will only grow going forward. Greg Sargent talks to Stan Greenberg, who assigns great power to Mitt Romney’s on-the-spot listmaking. Zach Carter and Jason Cherkis dive 10,000 feet deep into Bain Capital’s business deals in post-Soviet Russia. John Dickerson tries to bring some reason and sanity to the great gaffe debate. And Rick Hasen worries, fairly reasonably, about whether Republicans will accept a Romney loss. In 1996, before the 2000 Florida meltdown ending with the Supreme Court’s decision in Bush v. Gore, about 10 percent of people believed the way the election was run was somewhat or very unfair, with almost no difference in Republican views and Democratic views. By 2004, when George W. Bush won re-election over John Kerry, roughly 22 percent of Democrats thought the way the election was run was unfair compared with about 3 percent of Republicans. Yet in the contested Washington state election in 2004, when the courts handed the governorship to a Democrat after a Republican was first declared the winner, 68 percent of Republicans compared with only 27 percent of Democrats thought the way the election was run was unfair.